Ten swinging doors, countless plates of sardines and a great deal of off-stage noise bring riotous laughter to Jonesborough Repertory Theatre. I, along with the entire audience at Jonesborough Repertory Theatre on Saturday evening, would fall into that pitch-forward-in-their-seats category of laughter. “Noises Off” is a hilarious comedic farce, taking the audience behind the scenes of a play-within-the-play spinning rapidly out of control. Written in 1982 by English playwright Michael Frayn, the original production won the Evening Standard Award for Best Comedy and was nominated for the Tony Award for Best Play. “Noises Off” is currently in revival on Broadway, which gave the director an exciting opportunity to attend a Broadway production before bringing the show to Jonesborough. 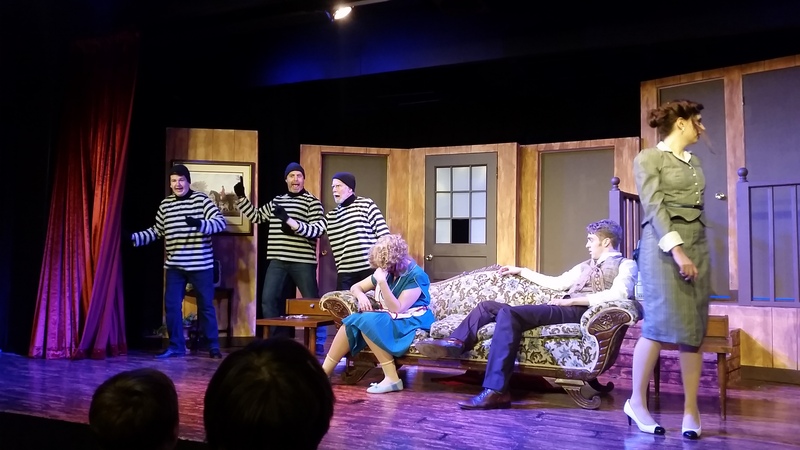 Knudtsen says that this was helpful in working out stylistic and technical kinks that “Noises Off” is chock-full of, especially considering the quaint size of Jonesborough Repertory. This is a comedy about the theatre, and according to “Noises Off,” there’s no one who can make better fun of the theatre than the people of the theatre themselves. “Every good joke has an ounce of truth, and ‘Noises Off’ contains more truth about theatre life than we’d like to admit,” Knudtsen said. The play commences in the middle of the final dress rehearsal for “Nothing On,” a slapstick comedy fueled by on- and off-stage love triangles between the actors. Rehearsal has gone horribly awry thanks to scatterbrained and pensive characters, reluctant to direction from “Nothing On’s” director. Through these tensions, the intermingled relationships between the rowdy stage troupe eventually become evident. The second act is the highlight of “Noises Off.” “Nothing On” is well into its run, at a tour stop in Ashton-On-Lyne (a fictitious English city based off Ashton-Under-Lyne). The set is flipped during intermission, and the entirety of Act II takes place “backstage,” with the fictitious audience facing opposite to the real one. Side-splitting laughter ensues as the plot unfolds. The actors maliciously sabotage one another as they go on and off stage, as drama continues to develop within their love triangles. Act II is almost entirely pantomimed and choreographed, showing this cast’s high skill level, precision and rigor. Finally, Act III is the oh-so-anticipated downward spiral. “Nothing On’s” final performance is a disaster to say the least, leaving the real-life audience just as dazed and confused as the actors themselves. These poor characters get themselves into such precarious and painful situations, it becomes quite impossible not to laugh. When casting, Knudtsen considered offstage personality in conjunction with on-stage talent, which was both apparent and quintessential to this production. The chemistry between cast members and character accuracy in each role is what made Jonesborough Repertory’s production of Noises Off so memorable. “Noises Off” performed its final show at Jonesborough Repertory Theatre on Sunday, March 20. The community theatre’s next production, “Bye-Bye Birdie,” will open on April 8.